More and more these days, you need to take steps to protect your premises from those who have no respect for private property. The threat from burglars and vandals is, sadly, real enough to give you hassle and distress should your shop, office or home be broken into. A reliable burglar alarm, properly installed means that the risk of being affected by burglary or malicious damage is reduced. This leaves you free to concentrate on the more important things in life like running a business or enjoying yourself with family and friends. Darlington Alarm Centre is a specialist burglar and security alarm supplier and installer operating throughout the north east of England. We are experienced installers of burglar alarms for both private domestic property and a wide range of commercial, industrial and retail premises in and around the Darlington area. Simply give us a call on 07834 858969 for all your alarm needs from installation in business or residential premises to service contracts, repairs and spare parts. We can normally advise you on the equipment you need over the telephone using our unique formula for installing your alarm system to your individual situation. Call us now on 07834 858969 for a free estimate for installing or repairing your burglar alarm. Our price includes parts, labour and travelling costs throughout north east England. 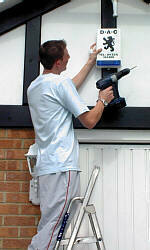 Get peace of mind with our annual service contracts for your burglar alarm system. Covers annual servicing, repairs, call out and parts (excluding batteries). Monthly or yearly payments. Disclaimer: Information on this site is subject to change at any time without notice. Darlington Alarm Centre accepts no liability for loss or injury arising from the use of information on these pages. All prices exclude delivery and VAT unless stated otherwise. All sizes are approximate. Pictures of products are for guidance only. Colours cannot be reproduced accurately on-screen due to technical reasons.